In March 2017, several dozen sweaty nerds (myself included) crowded into a Virginia bar to watch a solid hour of heavy metal; by December the band we’d come to see were performing on stage in a Spanish stadium before thousands of people. Needless to say, it’s been one hell of a year for A Sound Of Thunder. What led to such a transformation of circumstance? All it took was a great song and a well-timed revolution. You see, following Catalunya’s controversial independence referendum, which saw Spanish police using violence against voters, the band released their song “Els Segadors (The Reapers)” to show support for the citizens. This song, written a year prior as an homage to the Catalan heritage of the vocalist’s mother, was the band’s arrangement of the Catalan National Anthem, and has served as a rallying call for those who support independence of the Spanish region. Not bad for a band who considered itself a local heavy metal act up to that point, eh? But A Sound Of Thunder is no mere one trick pony; American or otherwise. 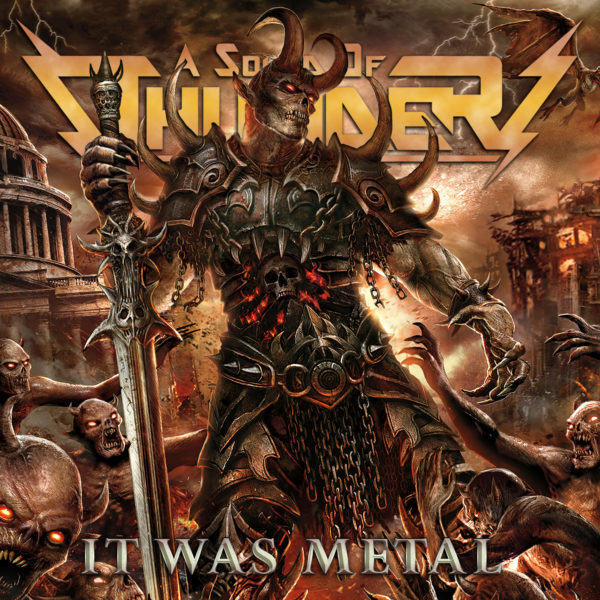 In June 2018, they released It Was Metal, an album brimming with melodic hypnotism, rhythmic ferocity, and more Blue Öyster Cult Easter eggs than you can imaginos. You don’t have to be a flaming telepath to enjoy this album, though I’ll admit that if you don’t spend half an hour looking up the medicinal use of Irish skulls after listening to ”Charles II,” you’re missing an opportunity. From the powerhouse opener, “Phantom Flight,” featuring Accept vocalist, Mark Tornillo; to the flux capacitor-equipped closer, “Fortress of the Future Race,” the band is firing on all cylinders. This is undoubtedly the band’s fastest album, overall, which keeps the “Hail!”s coming and the fists pumping. Yet, that doesn’t mean that the band has traded speed for its dynamics. Perhaps the best example of this is the nearly ten minute track, “Obsidian & Gold,” featuring the wonderful keyboard work of Tony Carey (Zed Yago, ex-Rainbow). For instance, there is a softer section of this song which pairs up the tender, loving vocals of Nina Osegueda over an understated, yet hauntingly creepy piano arrangement, which has the thrilling effect of drawing us in, while at the same time putting us on edge. Then there are heavier, mid-tempo portions of the song that sweep us away into huge, swelling sing-alongs. And once the guitar solo kicks in, it’s like a stampede of elephants, trampling all in its path. And did I mention the wonderful keyboard work? That was one sweet, sweet organ solo, Mr. Carey. While I wholeheartedly loved the contributions of the guest musicians on this release, it is really the ever-increasing talent of the four staple members: Josh Schwartz, Chris Haren, Jesse Keen, and Nina Osegueda, that elevate this album to such a shining display of metal. They have put out consistently solid releases since I first heard them six years ago, but I dare say this one takes the cake. Yes, it has even topped my previous favorite from them; the 2013 album, Time’s Arrow. And what’s more, is this one features a companion comic book anthology, turning each song into a short, several page, graphic adventure by legends of DC, Marvel, and Valiant Comics. I highly recommend picking up both, as the comics breathe even more life into the auditory journey. A Sound Of Thunder has really knocked it out of the park with this one. It Was Metal is a triumph for the genre.